Content by courtesy of : Suffolk Gem & Mineral Club, Inc. Whether interested in an adventure, or pondering the origin of nature, Paleontology can be fascinating and educational hobby. One of the most exciting activities in this field is attending a fossil dig. There are a number of places to dig, within a few hundred miles of Soffolk County, for either family fun or paleo-enthusiasts. We owe our scientific "awakening" and love of nature to the late John Mlecz of the "Petrified Creatures Museum" in Richfield Springs (10 miles north of Cooperstown NY. on Route 20). This museum and it’s adjoining fossil pit provides an ideal introduction to the world of fossils to the entire family. After viewing the museums displays people are invited to dig in the pit for Devonian fossils (approximately 390 million years old). Visitors are allowed to take home their finds. The sedimentary rock is very hard but full of fossils. Small children should be closely supervised. When we last visited this site, everyone who dug was guaranteed to go home with a fossil. The hours opened are seasonal. Another great collecting place for the whole family is Poricy Park in Monmouth County, NJ. This is a park that was preserved due to the efforts of its local community. Here they have a nature center, acres of woodlands, and generously allow moderate collecting of Cretaceous fossils that erode out of Poricy Brook. Visitors should only collect those fossils that wash out of the brook (as opposed to destroying its banks). The fossils are almost entirely sea life-extinct oysters, etc., although one year age, we found a small therapod tooth. Still another great family fossil collecting site is Beltzville State Park. in Pennsylvania. Unlike many other states, Pennsylvania allows fossil collecting in designated areas in some of it’s State Parks. Beltzville, located in eastern PA., is a man-made lake that has been made in a Mid-Devonian fossil bed. Fossils can be found by simply wading into the lake and looking at the rocks under foot. A complete variety of Devonian life is represented. People are asked to collect conservatively so that fossils will be available to all visitors. 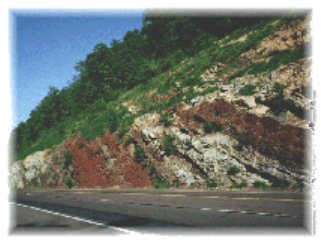 For the more adventurous, New York and Pennsylvania offer a variety of road cuts and fossil collecting locations. One of my favorites is the Suedeburg site in Swatara State Park, Central PA. This one is quite a drive but the mountains and miles of forests make a very scenic journey. One may want to stop along the way and pick up a nice piece of anthracite coal while passing through Carbon County on the way. The Suedeburg site is on the "old state road" that runs through Swatara. Finding this road can be more difficult than finding the site. Once you do get on the old state road there is a clearing, several miles into the park, with about 100yds of the Mahantango Formation exposed (approximately 375 million years old). Some of the fossils here can be spectacular. One year we found a partial trilobite with a rare impression of the softer tissue. The most important tool to bring is safety goggles (We have often learned this the hard way.) Some other good paleo-tools are hammers, stone chisels (or an old railroad spike), a whisk broom or old paint brush, many plastic bags and small sandwich bags, aluminum foil for delicate or broken fossils, and plenty of water. Always be certain that you have permission to collect at the fossil site. Try to avoid overcollecting. This will help keep fossil hunting available to everyone. Besides, who really needs a garage full of rocks? And finally, safety is always more important than any fossil.